The inaugural exhibition of the new Asia Society Hong Kong Center considers the role of Buddha in art. HONG KONG, China -- Traffic was diverted and uniformed guards were on patrol as several hundred guests got a private preview of Asia Society’s fortress-like Hong Kong headquarters earlier this month. "A Long Island Buddha,'' a contemporary work by the Chinese artist Zhang Huan, in one of the outdoor pavilions of the new Asia Society Hong Kong Center. Heads of government and culture made their way around the New York organization’s largest overseas outpost - a new compound that combines minimalist modern structures with a restored 19th-century British Army explosives magazine. The 1.3-hectare, or 3.2-acre, space opened after a decade of planning and construction, with care taken to preserve both the colonial-era buildings and a long-neglected wooded area above a busy commercial district. A sleek walkway suspended over the tree canopy was designed to zigzag around an indigenous bat population. New glassed-in halls were set amid ancient banyan trees, their roots growing into stone walls. Asia Society has long had overseas centers and offices - Hong Kong’s was the first to open in 1990 - but it has never before built a foreign facility of this size or significance. The building in Hong Kong, and another new facility in Houston, which is scheduled to open this spring, each cost about $50 million. Last weekend the center staged the premiere of a commissioned work by the Hong Kong composer Aenon Loo, accompanied by a video by Silas Fong, a local artist. The opening exhibition is “Transforming Minds: Buddhism in Art,” a modest but well-curated show tracing the religion’s past and present. 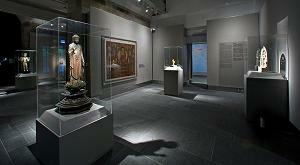 It matches 13 artifacts from the Rockefeller Collection of Asian Art with six contemporary works. The pieces, which range from a pair of marble Chinese bodhisattvas from 570 A.D. to an 18th-century Korean scroll, were chosen to track the evolution of Buddhism and, in particular, how its symbols and beliefs crossed cultural and national boundaries. One gem is a deceptively simple 8th-century Thai bronze sculpture of Maitreya, a young bodhisattva chosen to become a future Buddha. It shows a boyish, almost pre-adolescent slender figure with the elegance of a young David. The most beautiful face in the exhibition is carved of volcanic rock and belongs, unfortunately, to one of the many Buddhist sculptures that had their heads or hands hacked off long ago, probably by invaders or looters. What is left of this 9th-century Indonesian work reflects an Asian ideal - a serene round face, closed lotus-petal-shaped eyes, voluptuous nose and lips, and long earlobes. A favorite among visitors was “Amida Nyorai,” a delicate Japanese cypress wood carving from the 13th century with a hint of gold plating on the draped robes and light-colored crystals decorating Buddha’s head. Most arresting were the black crystals beneath his heavy lids. They were hard to see clearly at first, but when they caught the light, they gave off the liquid luminosity of real eyes. “Transforming Minds” is unusual in its mix of old and new religious works. The contemporary installations, though set off at a respectful distance, were shown in the same spaces as the artifacts. The Chinese artist Zhang Huan created two rather eerie Buddha heads from ashes left over from the burning of incense at a Shanghai temple. The former New York resident also made the “Long Island Buddha,” looking much like a giant copper head that had fallen from the sky and sunk halfway into the ground, that is displayed in an outdoor courtyard. “Lotus Sound,” by the Thai artist Montien Boonma (1953-2000), casts back to early Buddhism, when Buddha was often represented by a simple symbol, like a hand or a tree, instead of a human figure. Here, he used everyday objects: lotus petals covered in gold leaf float above 473 black terra cotta bells arranged in a semicircular wall. The bells were glued together for this show, but they were not for the original installations in the 1990s, when they were stacked precariously to symbolize man’s fragility. The strongest contemporary work was the only one to use an ancient artifact. For “Bodhi Obfuscatus (Space Baby),” the Korean-American artist Michael Joo took a regal 2nd- or 3rd-century Gandharan Buddha from the Rockefeller collection and surrounded its head with a halo of 50 surveillance cameras. The sculpture, from what is now a region of the India-Pakistan border, is set in a large, dark room lined with more than 90 mirrors and 10 TV screens. The Buddha’s handsome face, clouded by wires, lenses and cables, is only clearly seen when it flashes on the monitors. Visitors are confronted with endless reflections of themselves juxtaposed with images of the Buddha, breaking down the barrier between the worshiper and the worshiped. Wong Chiu-chan, a Hong Kong resident, attended one of the first public tours of the galleries and seemed to prefer the historic artifacts. “It’s not often that you see such a collection of fine pieces here in Hong Kong,” he said. 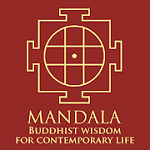 Images of Buddha are not often controversial, but there are sensitivities about whether he is portrayed respectfully. Although he said he was not particularly religious, Mr. Wong was unsettled by Mr. Joo’s digitized work. 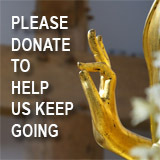 “It makes me feel uncomfortable to see the Buddha’s face obstructed by wires and television cameras,” he said. Asia Society in New York is not known for backing away from debate, and its Web site includes criticism on topics like Liu Xiaobo, the Nobel laureate who is currently jailed in China. “Transforming Minds: Buddhism in Art.” Asia Society Hong Kong Center, 9 Justice Dr., Admiralty, www.asiasociety.org.hk. Until May 20.